Do you have a big family meal every year for Christmas? Maybe you are like some and open your home up to those who may not have family to spend the holiday with. 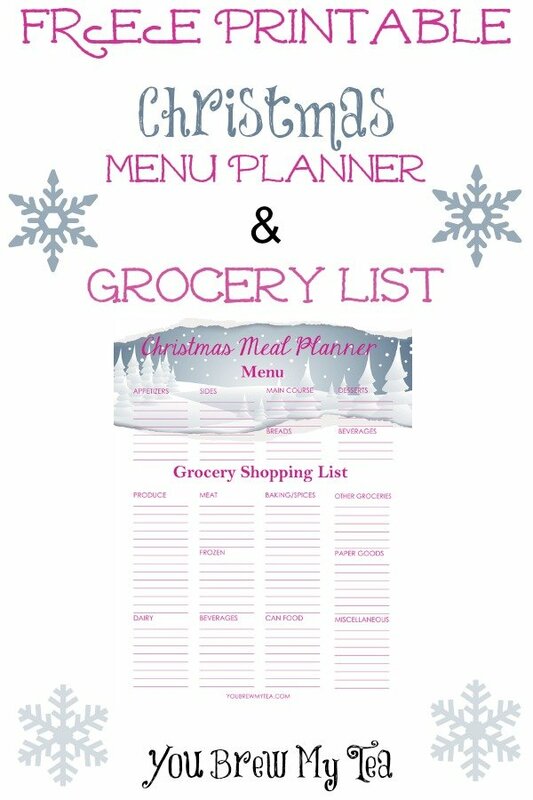 Whatever your tradition is, this Free Printable Christmas Menu Planner & Grocery List is great to keep you on track. Use this to plan out your menu from appetizers to desserts. Then on the bottom half you have the great place to create a grocery list. This keeps it all in one place so you don’t forget any ingredients. For as long as I can remember, our only Christmas tradition as a family was to spend Christmas Eve at my grandparents house. The last few years that has changed as my grandparents aged and spent time in nursing homes prior to their death. This year will be the first year without my Granny. I know it will be a tough holiday for my Daddy, and I hope we can manage to make it a little bit easier. I am planning to offer to cook for the holiday this year. We only have a few people in our family that come, so it doesn’t have to be a large meal. We may even do something simple like appetizers, dips, sandwiches and similar. I love that this free menu planner has places not just for your menu – but that menu broken down into all of the courses and needs helps a ton. For those who plan large meals with multiple courses, or perhaps want to have a potluck where they assign dishes to individuals, this is a great help. Planning your holiday event is much easier when you have easy to use resources like this. 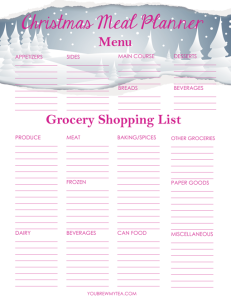 Print your Menu Planner & Grocery List Here! Looking for ideas of great menu items for your Christmas meal? Check out our favorites!